In the quiet of the early morning of Wednesday, August 30, 2017, I realized I was in labor with our fifth child. Adam called his mom and she came to our house to be with Teddy and Peter, who were asleep. After laboring at home for a couple of hours, Adam and I headed to the hospital where our first baby girl was born at 38 minutes after we arrived to the hospital - even faster than Simon's delivery. After having four boys in a row, the shock of a girl took about two days for us to get used to. What a beautiful surprise. Please welcome Marigold "Goldie" Joy Balentine! Goldie adds a sweetness to our lives that I didn't know we were missing. Teddy is completely smitten with Goldie and Peter, well he likes her but certainly doesn't like his rank in birth order changing. 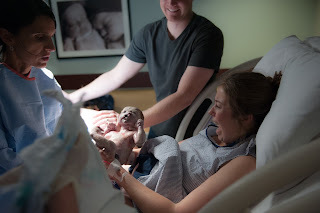 The miracle of life that happens in the holy delivery room still has me in awe. Life brought forth - in creation with God and my best friend. A baby who breathed and cried! Safety and good health for both mommy and baby. Transferring from delivery to mommy baby floor. Then leaving the hospital WITH my baby. I am familiar and know so many others who have left without their baby. Mothers who have left without their uterus. Lives changed with the complete unexpected happening. I can hardly walk through these first days of new life with Goldie without thinking about where we have been and where so many of my You Made Me Mom friends have been/currently are. Our perspective forever changed and I am grateful for our story of life, loss and our great Savior who sacrificed and reigns. Goldie doesn't replace our losses in any way but certainly feels like a kiss on the forehead from our Lord. Lord, Thank you for this life. I see your fingerprints all over my life and I can't believe the gifts you've entrusted me with. Use my life to reflect your Light which consistently points back to you. Let Goldie know you and trust her life with you. Amen. Big brothers Teddy and Peter meeting baby Marigold for the first time! Big brothers moving baby sister to mommy baby floor. Is this how you do the headband thing?! New to the girl mom thing! Day four with Goldie. First morning with the whole family together! from Adam and Amy Balentine on Vimeo. Oh Amy! What a precious gift. I am so happy for you.